SP 5.7 Professional - the best Speech Productivity has to offer! If you are serious about your speech productivity then SP 5.7 Pro is the right choice for you. Functionality of the Dictation Boxes has been greatly enhanced and two new versions were added. Quick Store now works in all browsers and Application Activation has become much more powerful. Of course SP 5.7 Pro also includes Chrome Search and Speaker. A very powerful tool has been added to the package. 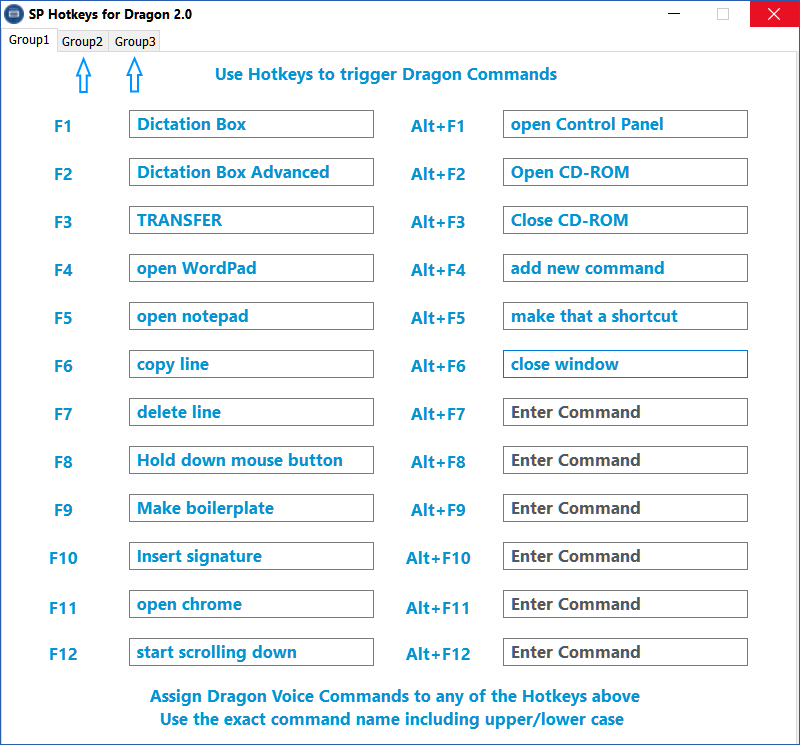 With Hotkeys for Dragon 2.0 you can assign 72 Dragon voice commands and launch them all with a Hotkey! But wait there's more. What about a fast, feature-rich, assistive alternative to DragonPad? 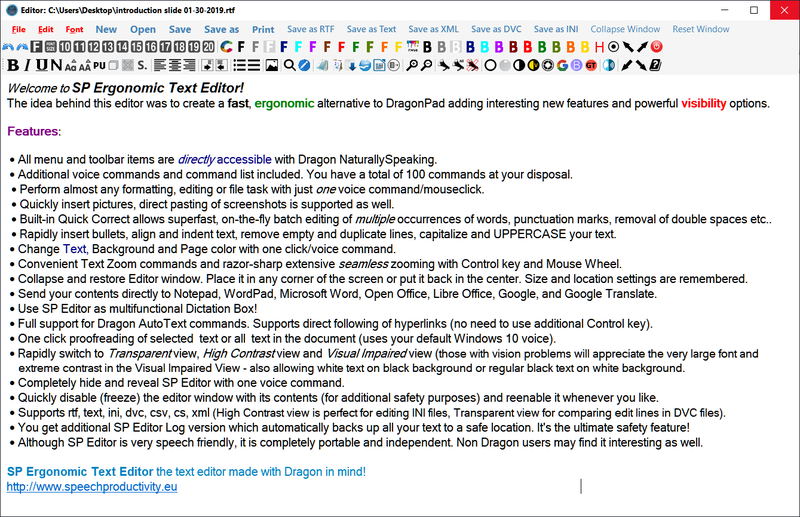 SP Ergonomic Text Editor is here! Dragon & VC Restart now also offers support for KnowBrainer and SpeechStart+. Quickly relaunch them all, with a Hotkey! The Pro Dictation Boxes can quickly be maximized and minimized. Most Boxes support custom resizing as well. Swiftly place them in any corner of the screen with convenient voice commands. Or manually place them at a pixel precise location of your preference. Size and location will be remembered next time you launch the box. This is a global setting which will reliably persist after reboot. Completely hide the Dictation Box (with its contents) and bring it back with just one voice command. The perfect privacy solution if you're temporarily away from your computer. Visibility and accessibility are core features of SP Pro. Several boxes have one click text resize/color options and built-in high contrast, compact and transparent modes. 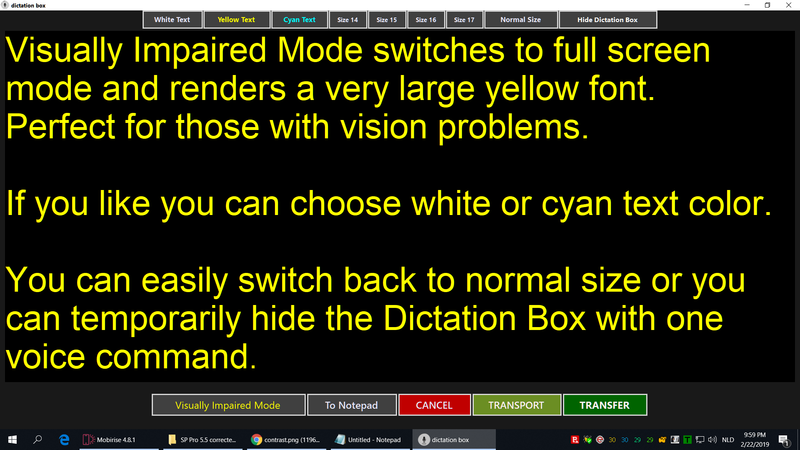 The dedicated High Contrast Dictation Box has convenient text zoom and color commands. Users with eyesight problems will welcome the Visual Impaired Mode which renders very large, razor-sharp font. Translucent Dictation Box has eight levels of pseudo-transparency. Transparent Dictation Box has true transparency (allowing all light to come through). Resulting in a crystal-clear view on the underlying target application. Apart from the Default Dictation Box you get Advanced, Large, Log, Translucent, Transparent, TTS, Non-Clipboard, Tiny, Top Left and Hotkey controlled Push & Talk Dictation Box versions. Transfer all text in the box or only the text that you have selected. 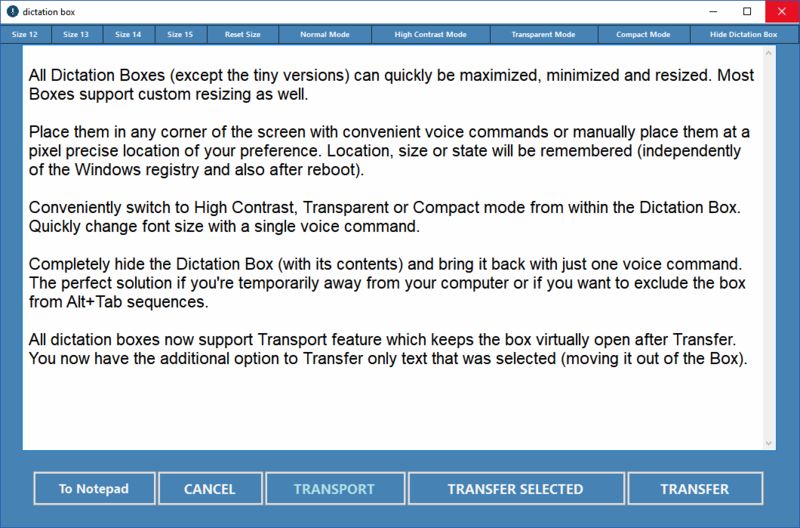 Optional TRANSPORT feature instantly reopens the box after transfer, keeping the Dictation Box "virtually open". You can transfer directly to supported applications like Chrome, Internet Explorer, Word, Outlook, Thunderbird when they are minimized or don't have focus ("virtual locking"). This is great if you work with multiple programs or decide to transfer your dictation to another application. 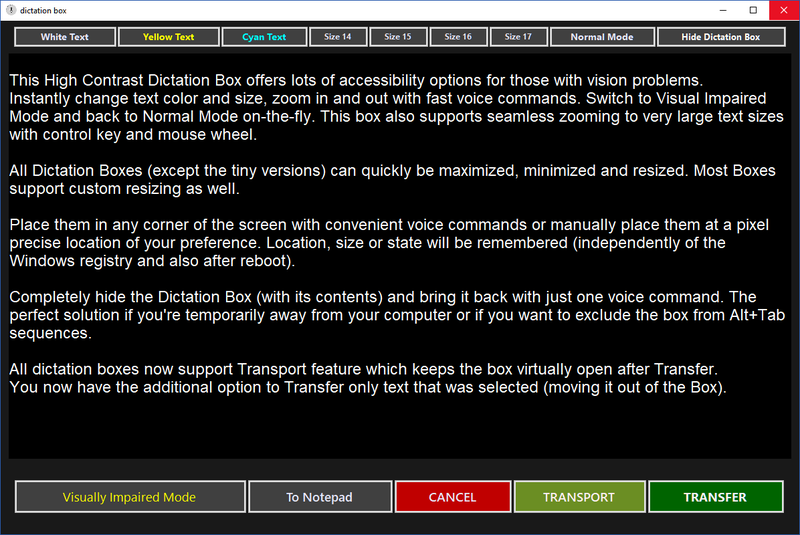 A special Dictation Box version completely controlled by Hotkeys. Launches instantly. Perfect for Facebook and Messenger programs but also a good solution if you only need to dictate briefly into certain applications or if you are working in a noisy environment. SP Standard already gives you the option to relaunch Dragon (and VoiceComputer) with a simple Hotkey. but with SP 5.7 Pro KnowBrainer and SpeechStart+ are supported as well. It's the perfect solution if either Dragon or any of the other applications have become unresponsive. No more waiting or opening the Task Manager to go through the cumbersome process of killing each process manually. One simple Hotkey quickly relaunches them all! Application Activation just got better! Access, Chrome, Command Browser, Dictation Box, Documents, DragonPad, Edge, Excel, Windows Explorer, Firefox, Hotkeys for Dragon, Internet Explorer, Libre Office Writer, Notepad, One Note, Open Office Writer, Opera, Outlook, Paint, Paint. NET, Pictures, Publisher, Quick Store, Recycle Bin, SP Editor, This PC, Thunderbird, Visual Studio, Word, Word Perfect, Wordpad. Have a bunch of applications open and want to quickly activate one and close another? It's as easy as this example: "Activate Internet Explorer", "Close Paint.NET". Ergonomic alternative to DragonPad with lots of assistive and visibility features. Includes Quick Correct which enables on-the-fly correction of multiple occurrences of words, punctuation marks, unnecessary spaces. You can instantly replace all flat apostrophes in your document with curved apostrophes, or all flat quotes with curly quotes and pretty much everything else you would like to replace. Remove empty and duplicate lines. Reliably convert all lowercase text to all uppercase instantly. You get an additional Log version that silently backs up your dictated text and automatically adds date and time. Best of all SP Editor has a Transfer Text function so you can use it as a very powerful and versatile Dictation Box as well! 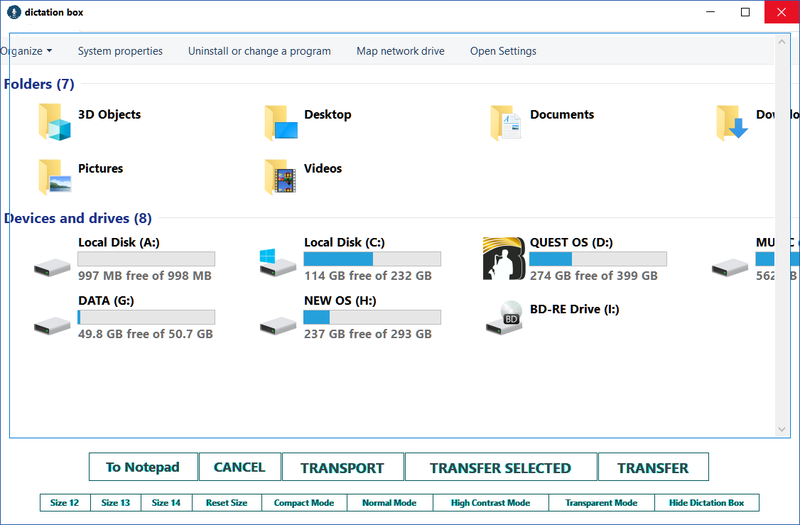 In SP Standard Quick Store only works in Chrome and Internet Explorer but in the Pro version it works everywhere. The Quick Store URL command is available in all browsers, even in Edge. It's also a great command to use in Windows Explorer because there it will quickly save the Explorer folder path. This is convenient if you want to create voice commands to bring up folders (using AppBringUp or ShellExecute). The Quick Store That command has become universal and works in any application where you can select text. Quick Store really is the fastest, most ergonomic way to quickly save URLs and text. There's no interruption of your workflow! Hotkeys for Dragon - give your voice a rest! You can store a total amount of 72 Dragon voice commands (both built in and custom Dragon commands) that can then be launched with a Hotkey. There are three group pages (tabs) each with 24 Hotkey combinations. Changes are applied immediately (real-time) and stored to the registry. Control + Win + Function Keys.